Polyphenols are produced by plants to offer them protection from the suns radiation and to help defend against disease. They protect us in a similar way by acting as antioxidants to help combat everyday insults (UV radiation, cigarette smoke, free radical formation) to improving immunity through their activation of key genes. The amount of polyphenols in foods can vary widely depending on where they are grown, how they are cooked, and whether they are organic or produced conventionally. For optimal health, you need consistent consumption of very high levels of fruits and vegetables every day to maintain adequate intakes of polyphenols. Despite the health benefits of polyphenols, only 1 out of 10 adults meets the recommended intake of fruits and vegetables per day. 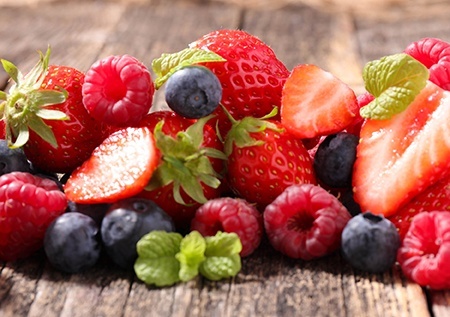 The Dietary Guidelines for Americans and MyPlate encourage individuals to consume 1 ½ to 2 cups of fruit and 2 to 3 cups of vegetables per day as part of a healthy diet. That said, our intake doesn’t come close to that and the ones we do consume are less than ideal as they are higher in carbohydrates and lower in polyphenols. Bananas top the list for fresh fruit consumed and potatoes and tomatoes (technically a fruit) are the main vegetables we consume primarily in the form French fries and pizza sauce. When it comes to how many polyphenols you should consume, there are benefits ranging from intakes of 500mg to 1500mg per day. Dr. Sears would suggest aiming for a minimum of 1000mg per day. The concentration of polyphenols in vegetables (0.1% by weight) and fruits (0.2% by weight) can be low, requiring high levels of consumption. 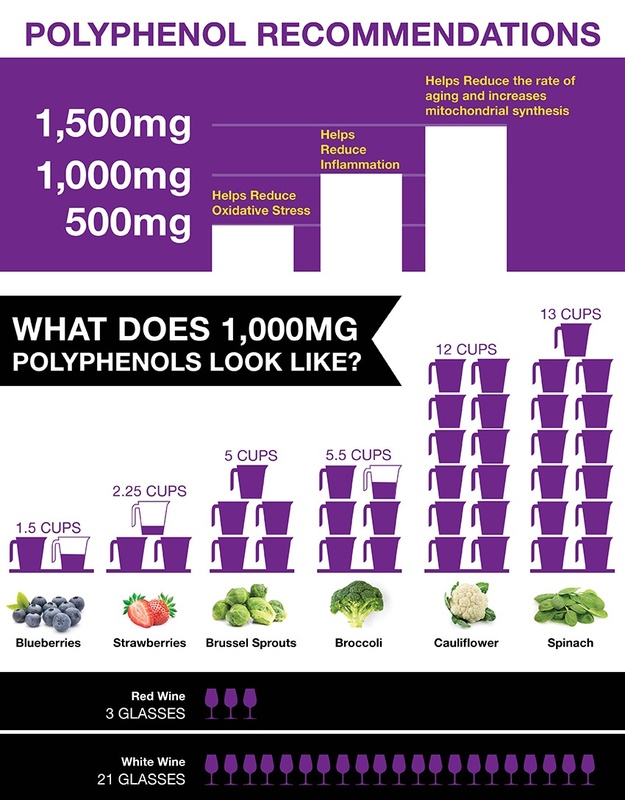 To give a sense of what 1000mg of polyphenols per day looks like, it could be approximately 12 cups of cauliflower, 1.5 cups of blueberries, or 3 glasses (~5 fluid ounces each) of red wine or some combination of various fruits and vegetables. Here’s what it would take to reach these levels in foods…. Since few Americans are taking in adequate levels of fruits and vegetables, following the Zone Diet can help you reach your goals. The use of purified polyphenol extracts rich in delphinidins makes it easier to consume adequate levels for the desired benefits you want to achieve. 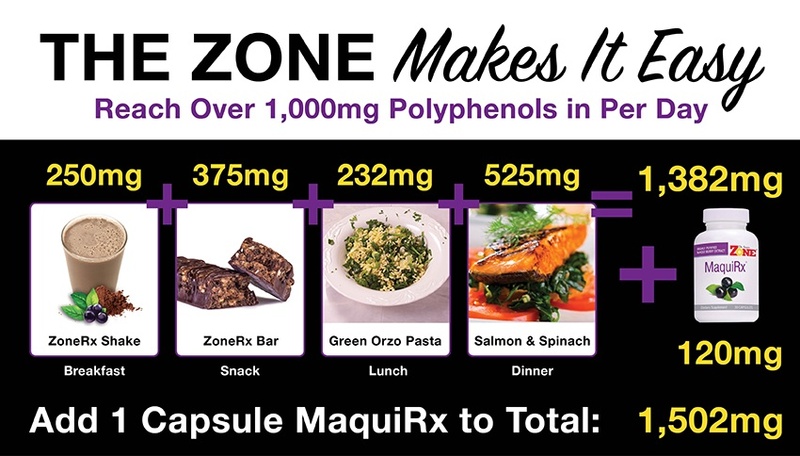 Starting your day with a Zone Shake for breakfast (250mg), a Zone bar for a snack (375mg), Zone pasta with vegetables for lunch (232mg) and a Zone sensible dinner (525mg) you'll be at almost 1400mg in a day with limited effort on your part. Plus if you want an added boost taking MaquiRx might be the additional push you need to hit 1500mg no problem. Below we have provided recipe cards for the above lunch and dinner suggestions. Check out the link at the bottom of this blog for hundreds of delicious Zone approved recipes for you to choose from to stay in the Zone all day long. Add Zone orzo and stir until broth is almost all absorbed, about 12 minutes. Add baby spinach and stir until liquid has been absorbed. When cool, add scallions, parsley, lemon juice, extra virgin olive oil, salt and pepper. Pour the balsamic vinegar and honey into a small saucepan; then bring to a boil. Cook over medium heat until the volume is reduced by half and a syrupy consistency is obtained, 5-7 minutes. Set aside. Prepare the spinach. Wash and drain rapidly then transfer to a saucepan without adding any water. The water trapped in the leaves after gentle shaking is enough to cook them. Add salt, cover and cook over high heat 3-4 minutes until the leaves wilt. Avoid overcooking, otherwise the spinach will become brownish. Transfer the spinach to a colander and press to remove excess water. Set aside. Lightly oil salmon on both sides. Heat a grooved, thick-bottom frying pan or a skillet that has been sprayed with cooking spray. When hot, add the fish, skin side down, and cook until the edges become opaque and lighter colored, about 5 minutes. Turn and cook an additional 3 minutes. Peel off the skin then season with salt and pepper. Check with a fork to see if it is cooked through. Transfer the spinach to warmed serving plate. Place the fish on top and drizzle with the balsamic syrup. Serve. Have a small cup of mandarin oranges for dessert.